London Stansted CEO Ken O’Toole has called on local businesses, community leaders and regional organizations to press the UK government to upgrade rail links to the airport. 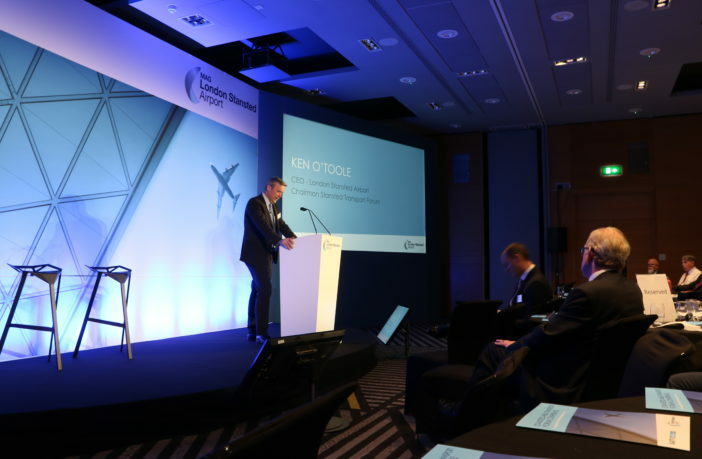 Addressing more than 150 delegates at the annual Stansted Area Transport Forum, O’Toole said better connectivity in and out of the airport would further boost the local economy, ease access for the 12,000 on-site workforce and help attract a greater number of airlines and new destinations. “What a lot of people don’t realize is that often it only has to be incremental improvements to airport access that can make a significant difference – the Airport Operators Association estimates that a 5% improvement in average journey times to and from UK airports could deliver a 2.7% increase in passenger numbers, generating an additional £1.9bn (US$2.5bn) for the UK economy and supporting an additional 32,000 jobs,” said O’Toole. “Our view that journey times need to come down has been endorsed by both the Airports Commission and West Anglia Task Force but unfortunately these requests have fallen on deaf ears within central government and Network Rail, despite the number of passengers and commuters using the Stansted Express growing by 143% since 2013. “Of course, journey time improvements require infrastructure investment. While we are prepared to proportionately contribute to the costs involved in seeing journey times lowered, any significant improvement will require considerable investment.